Combine all pasta ingredients in a food processor and process for 60 seconds. 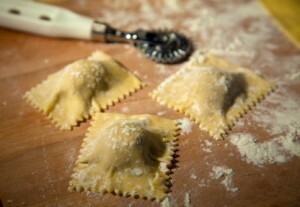 Check consistency and add a small amount of flour if pasta is too wet, or a small amount of water if pasta is too dry. Continue processing until the consistency is right. Knead the dough and let rest for approximately half an hour before use. Roll pasta out using a roller machine, beginning with the widest setting and continuing to decrease width until it’s thin enough. Stuff ravioli shells as soon as the pasta sheets are rolled to ensure that the pockets will seal well. If you need to refresh pasta sheets, brush with egg wash or water at the seam. Boil and serve with your favorite pasta sauce, seasoning, or cheese.